Chandana D Kankaria is back in the city to present her recent works. Her watercolors are once again inspired from nature, although a few larger works portray the city skyline, and interiors of homes. 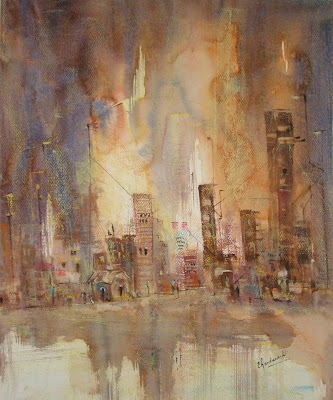 The artist offers, “You can’t hide or conceal anything when you work with watercolors. They are transparent and every stroke – whether right or wrong is visible to the naked eye”. Most of her paintings are pleasant, and delicately rendered in soft shades. The artist has good control over the medium and is able to play around with light and shade effect, and colors. However, in some of her larger works what strikes a discordant note is the linear disproportion of skylines. Buildings that appear to be inclined at an angle create a visual conflict. The cityscapes bathed in brilliant hues form a large part of the collection. Then there are a bunch of balloons, drapes in a room and sidewalks with colorful umbrellas. The colors though are sometimes too bright and could be toned down for a more refined impact. The smaller works are based on nature and are beautifully evocative and follow a subtler color palette. The works have a cultivated air of romance and a pleasing ambience. Overall, it forms an appealing collection. Chandana is a fine arts graduate from Karnataka Chitrakala Parishath and has a penchant for watercolors. She has held a few solo shows in Bangalore and Chennai. An avid traveler, she finds inspiration from old buildings, pilgrimage places and nature. The exhibition of paintings is on till April 26 at Time and Space art gallery, No.55, Lavelle Road, Bangalore - 1.